OCZ Technology is a name that needs no introduction to the computer enthusiast community. 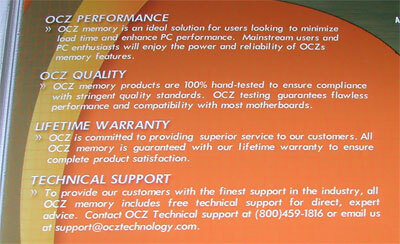 OCZ is easily one of the most well known and recognized names when it comes to high performance RAM. They have consistently provided some of the most recommended performance RAM brands available, often leading the market in clock and cooling enhancements. Windows Vista on the other hand is in the infant stages in terms of being out in the wild world. Vista has promised many new features, and as we all are familiar with, software drives hardware requirements. Thanks to many of the new features of Vista, performance users will need to upgrade to 2GB+ of RAM to achieve the same relative smoothness as was seen on WindowsXP platforms with up to 2GB of RAM. This is where OCZ has stepped in. Today, we’ll be taking a look at OCZ’s 2x1GB Vista Upgrade Kit. This kit is designed for those users that are migrating from WindowsXP to Windows Vista with limited RAM, 1GB for example. OCZ even goes as far as describing this kit as “the ultimate upgrade from 1GB of RAM ensuring the best possible gaming and productivity on Vista systems”. Any serious enthusiast, and especially gamer, knows the benefits of increased RAM. Albeit small in the scheme of things such as FPS, there are clear load time and smoothness benefits. Thanks to the new SuperFetch feature in Windows Vista, this performance boost becomes far more noticeable in terms of load times. It is important to note that the Vista Upgrade Edition modules are also available in single quantities of 1GB, so if a 2GB kit is out of your price range you can still hit the 2GB mark. Before we examine the modules and performance, let’s take a look at the official specifications of OCZ’s 2GB Vista Upgrade Edition. ..:: OCZ Vista Upgrade Edition Specifications ::..
As you can see from the specs listed above, upgrade is the proper term for describing these modules in terms of the EVP rating. Most of the high performance overclocking kits have extreme EVP ratings in the 2.1-2.2V range, while here we only see 1.85V which isn’t much over stock DDR2 voltage. Timings also fall in the upgrade category as several DDR2-800 performance kits have tighter timings than 5-5-5-15 now. In terms of product packaging, OCZ adopts a keep it simple stupid approach. Unlike what we recently found with our DDR2-1066 Super Talent kit, OCZ has included a small folding manual of sorts in all five main languages. Given that this is an upgrade kit rather than an enthusiasts dream, this makes logical sense and should be expected. 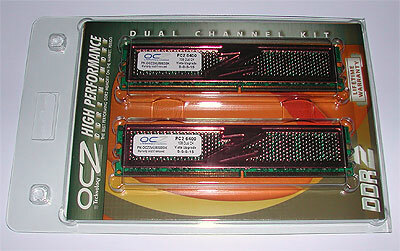 The modules themselves feature OCZ’s XTC heatspreader affixed on both sides of the modules. These XTC heat spreaders have been out for some while, so I won’t go into too much detail on how they work other than the obvious fact that the honeycomb cutouts allow cool air to flow around the RAM chips far better than solid metal, reducing hot spots. These also allow for a much lighter cooling solution. Finally, the only markings on the heatspreaders are the typical production identification sticker. 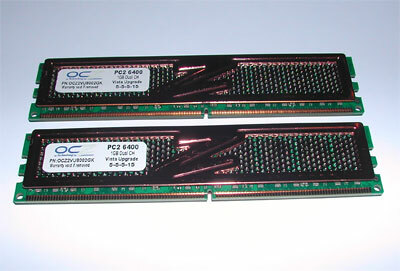 You can see that each module is 1GB and rated as PC2-6400, or DDR2-800.